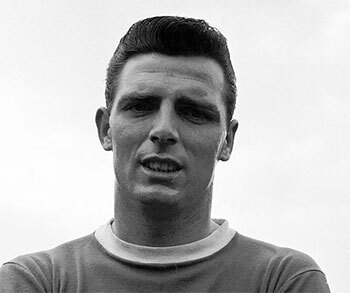 His Goodison Park career started brightly yet ended with disappointment but there's no denying that Fred Pickering was a centre-forward in the classic Everton mould. Having been fortunate enough to meet Fred at Gwladys Street Hall of Fame dinners at the Adelphi Hotel I can attest that the quietly-spoken Lancastrian was one of football's gentlemen and by then with his silver hair and glasses he cut a rather different kind of figure to the hulking powerhouse who once terrorised the game's leading defences. Given the crushing disappointment he suffered during his Blues career, Pickering could have been forgiven for shying away from such functions but he remained very much part of the Everton family and would attend to meet up with old team-mates and speak to the fans, many of whom were too young to have watched him play, in his humble, down-to-earth manner. Many years earlier, Pickering had been the lavish signing who epitomised John Moores' Mersey Millionaires and their zenith. Everton were reigning League Champions when they paid a £85,000 fee – a record at the time between two British clubs – to prise Pickering from home town team Blackburn Rovers in March 1964. The Blues were bidding to retain their title and their new boy started with a bang, netting a hat-trick on his debut in a 6-1 mauling of Nottingham Forest at Goodison Park. In total, Pickering would net nine goals is just nine games as the season finished but Harry Catterick's side would ultimately finish third with Liverpool claiming their first League Championship under Bill Shankly. The following campaign would see Pickering smash in 37 goals for Everton in 51 matches but again silverware eluded them. His greatest disappointment came when he was left out by Catterick for the 1966 FA Cup final. A cartilage problem had become increasingly painful and despite having scored in each of the previous rounds, Pickering was forced to miss the 1-0 victory over Manchester United in the semi-final. Although he declared himself fit for Wembley, Pickering was not selected by his manager who instead chose to stick with understudy Mike Trebilock – a fringe player whose Everton career would ultimately consist of just 14 games. Catterick's choice was vindicated as Cornishman Trebilcock bagged a brace in the Blues 3-2 comeback victory over Sheffield Wednesday while a besuited Pickering was forced to watch from the sidelines, much like England's Jimmy Greaves at Wembley later that year when Geoff Hurst netted a hat-trick against West Germany in the World Cup final. From then on, Pickering's days at Everton seemed numbered, especially with youthful homegrown prospect Joe Royle emerging and 15 months after the final he was sold to Birmingham City for £50,000. He would later return to the North West with Blackpool and had a second spell at Blackburn before hanging up his boots aged just 30 in 1971. I read about this, and sad news.